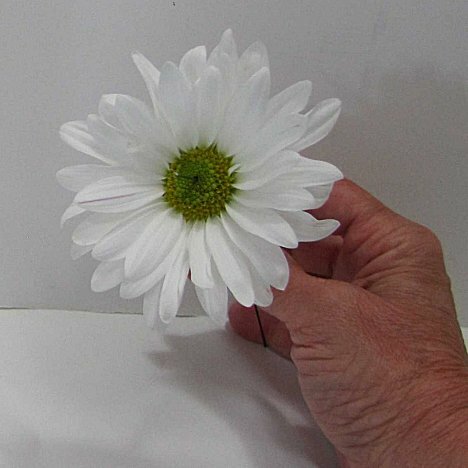 Daisies commonly grow on a single stem with several short 3 - 5 or more laterals of blooms. 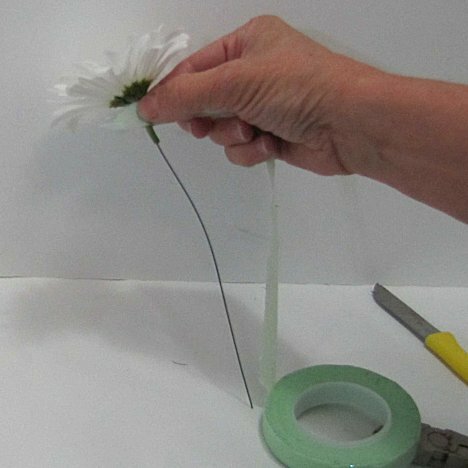 The wiring techniques shown in this tutorial use wire to secure the flower heads and lengthen the stem if needed. 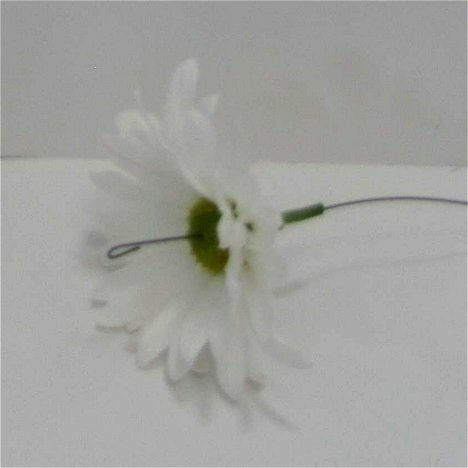 Wiring a daisy boutonniere helps strengthen the stems and keeps the heads securely attached to the boutonniere. 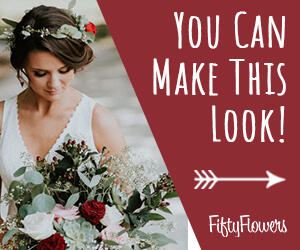 I usually wire every flower I use for boutonniere work. 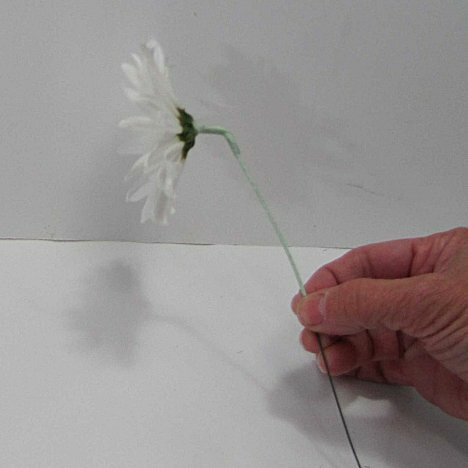 A daisy stem often has short laterals (individual flowers shooting off the main stem) that can be cut off into separate flowers for individual boutonnieres. You can generally make several boutonnieres out of one single stem. 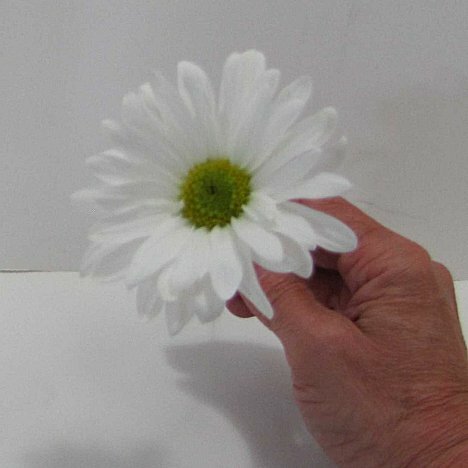 Cut the daisy off the stem with a sharp knife and leave about a 1" to 2" stem to work with. Insert a 26 gauge floral wire into the cut end of the stem. 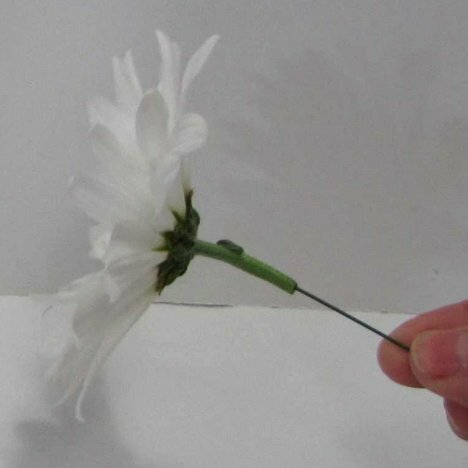 Push gently up until the wire pierces the center of the flower and comes out. Using needle nose pliers, create a small hairpin shaped hook on the end of the wire. Pull the wire down until the hook buries itself into the center of the flower. 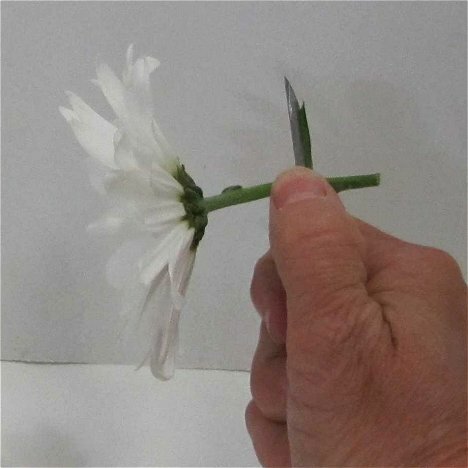 Begin by taping the boutonniere with green stem wrap. Start at the very top, right at the base of the flower head. 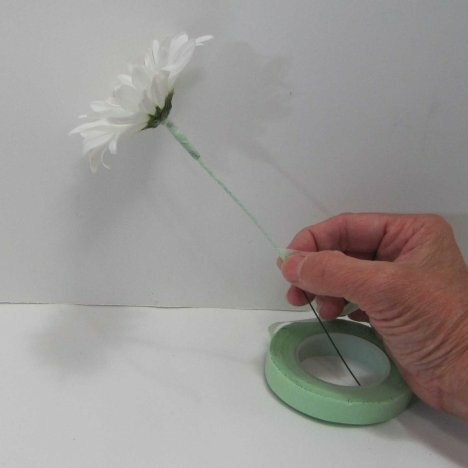 Pull the tape as you turn the flower, winding the tape around the stem. The tape will adhere to itself, creating a tight bond. Once finished, bend your flower head forward. This is the reason I wire and tape, because you have better control over where the head of the flower faces. 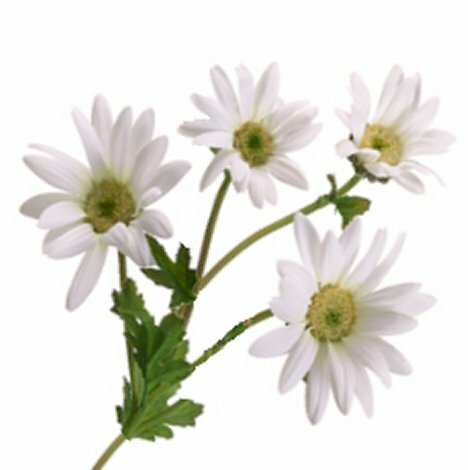 Otherwise your daisy would be facing straight up, squashing half the flower against the lapel instead of seeing the whole flower head.